Looking for the perfect indoor summer camp in Kansas City? Pinnacle's summer camps provide the perfect balance of games, crafts, play, and exercise. Our unique summer camp is for ages 3-12. Click enroll from the website menu or click here. Log in to your Parent Portal account. Click summer camp on the left hand menu. Find a theme or day that matches the needs of your schedule. Click on the Enroll Now link and fill out the requested information. You can also call us at 1-913-422-0161 or email us with any questions! 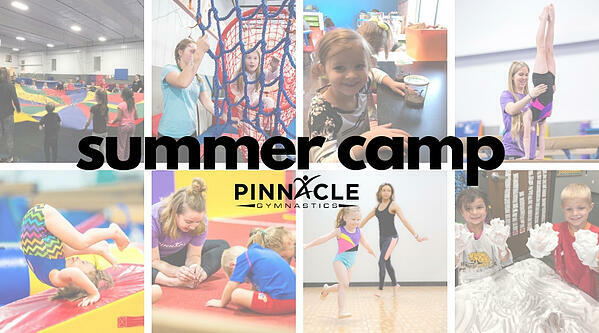 There are many camp options at Pinnacle Gymnastics. Day Camp is a morning option Wednesday through Friday for ages 3 and up. Monday afternoons, avoid the summer slide with our school age enrichment led by elementary school teachers! Tuesday afternoons, explore the world of art with our art teacher led drawing classes. Wednesday afternoons, we offer a Ninja Camp for ages 5+. Thursdays, we offer Thrilling Thursday camp for ages 5+. We offer multiple child discounts as well as stay through credits for Wednesday and Thursday all day campers. Our campers have a blast every year! We love seeing the smiling faces, hearing the giggles, and watching our participants gain strength, flexibility, confidence, and brain power all summer long! Want to learn more about Summer Camp?